Fourth parties are just as important as third parties. They can have access to your confidential information and thus you must make sure that they understand your rules regarding the use and security of non-public information. Monitoring a fourth party is a unique challenge and can be tricky, but there are steps you can take to demonstrate to the regulators that you have adequate procedures in place and made all reasonable efforts. 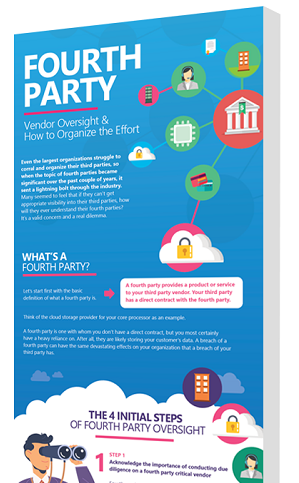 In this educational infographic, we'll walk you through fourth party oversight and how to organize your efforts.